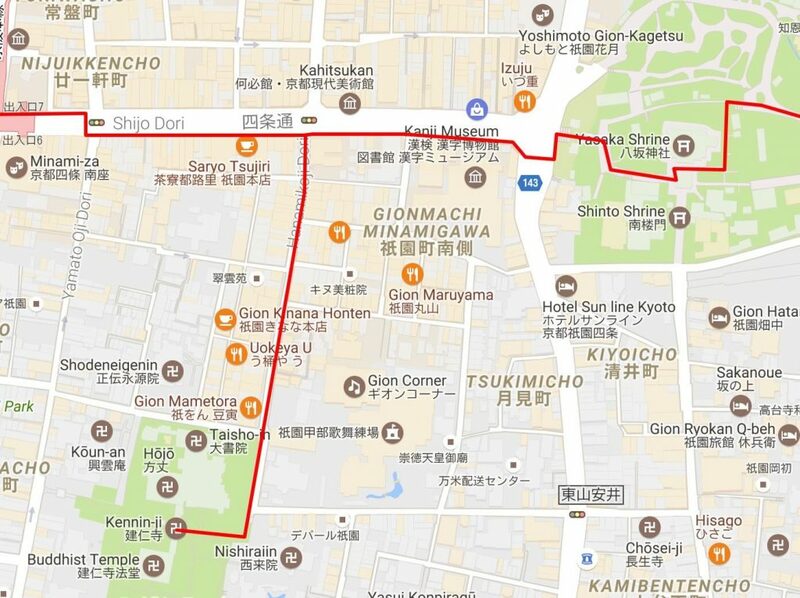 So I was just answering a question by another user over on the Japan Guide forum (which btw is a great place to ask if you’re planning a trip to Japan and have some questions), and decided I’d make a Gion walking tour map for her. 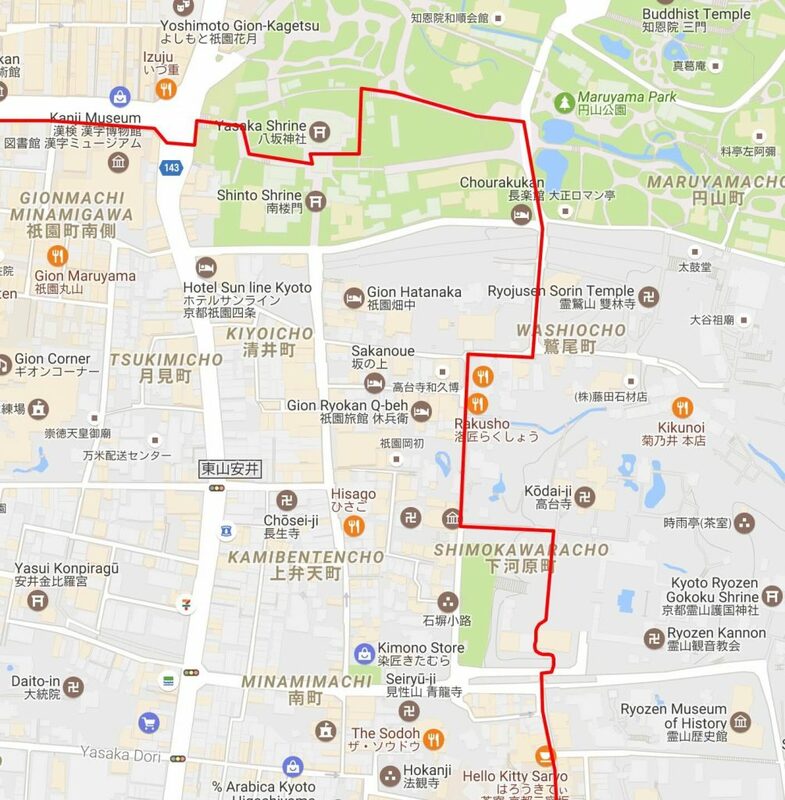 And with the cherry blossoms about to open in Kyoto, I figured this map would be a good basis for a blog post – this walk takes in several of Kyoto’s most famous sights as well as several of its best cherry blossom spots. 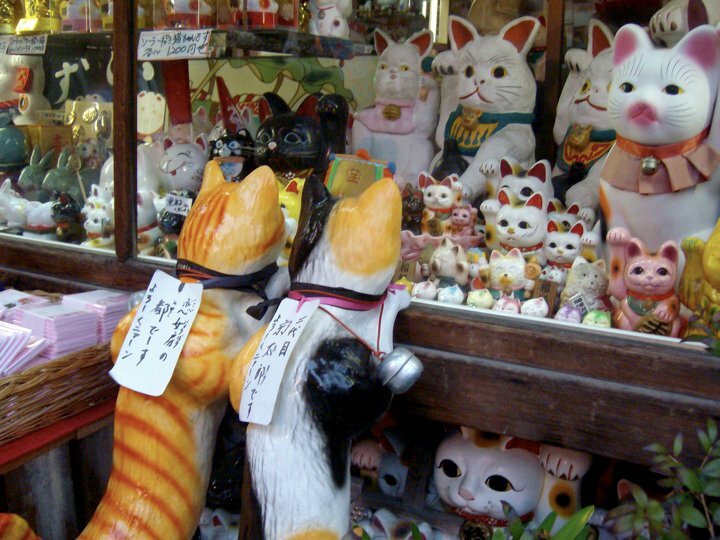 Starting from Kawaramachi station (Hankyu line), come out of exit 1A and you’ll find yourself at the southern end of Kiyamachi-dori (alternatively, start with a visit to nearby Nishiki market before heading to Kiyamachi-dori). Walking north up Kiyamachi-dori you’re passing through the city’s main nightlife area, but in the daytime it’s a quiet street alongside a canal which is lined with cherry blossoms; when the sakura are in bloom it’s absolutely gorgeous, especially with the row of traditional-looking buildings backing onto the canal near the station. 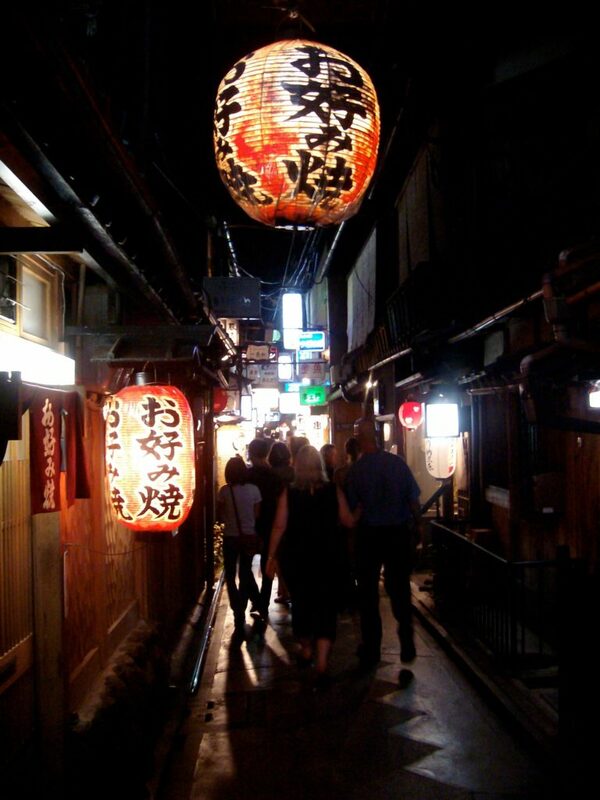 Just before reaching Sanjo street (after maybe a 10-minute leisurely stroll), turn right and find your way through to Pontocho, a narrow and atmospheric alley packed with tiny bars and eateries; again, it’s very quiet by day but remember the location and return for an evening if you have time. Once across the bridge you’re entering the Gion district; keep going straight along Shijo Street, but get over to the south (right) side so you can turn down Hanamikoji-dori, which is the main picturesque Gion teahouse street (unfortunately open to vehicles). Taking a stroll down there (and perhaps exploring some side alleys) will bring you to Kenninji temple; the temple grounds can be wandered for free, and have some nice sakura trees if you’re there during the blossom season, but it’s well worth paying to enter the temple buildings. Inside you’ll find several nice Zen gardens in three different styles (sand & stone, moss & rock, and circle, square, triangle), a famous screen painting of Fujin and Raijin (the wind and thunder gods), and an awesome ceiling fresco of a pair of dragons; I actually think it might be my favourite temple interior in the city. 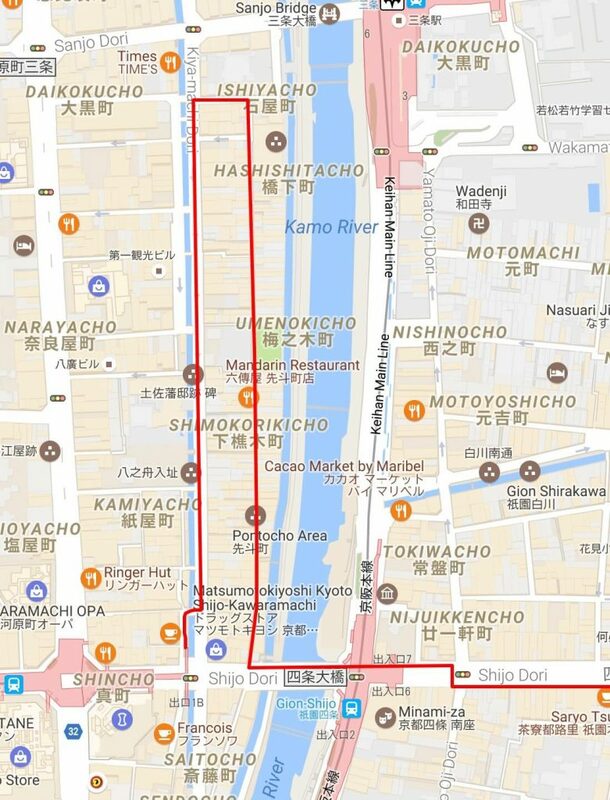 Once done there, head back up to Shijo-dori and turn right again to walk the short distance to the end of the street where you’ll see the entrance to Yasaka shrine on the other side of the crossing. Yasaka shrine’s of great importance to Kyoto, especially through its key role in the Gion festival, though it doesn’t have such impressive structures or views when compared to some of the other temples and shrines in the city; passing through the shrine brings you out into Maruyama Park, which is Kyoto’s main spot for hanami parties i.e. groups of revellers sitting under the cherry blossoms and getting drunk all day. If you’re there in blossom season, the park will be spectacular, most especially the incredible weeping cherry tree standing proud in the centre of the park, its blossoms tumbling down in a frozen pink cascade; the park will also be lively, and you’ll find a bunch of food stalls and temporary restaurants with tables set up under the canopy of blossoms, so this might be a good place to grab a bite! Outside the blossom season Maruyama Park’s much quieter, but still nice to stroll through. Turning south out of the park you can find your way through to Kodaiji temple along some nice old Kyoto alleyways where hand-pulled rickshaws ply their trade; this temple also requires paid entrance, but if you do go in you’ll find one of Kyoto’s best Zen gardens which is spectacular in blossom season (and in the autumn colour season if you’re there in late November / early December). 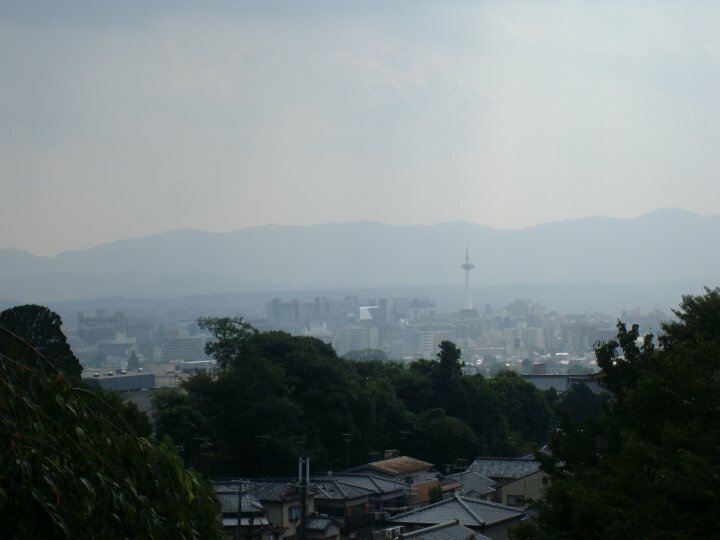 You can also visit the large seated Kannon statue next to Kodaiji, and there’s a good view from the car park there of the Hokanji pagoda in the foreground, Kyoto Tower in the middle distance, and the mountains beyond that (on a clear day). 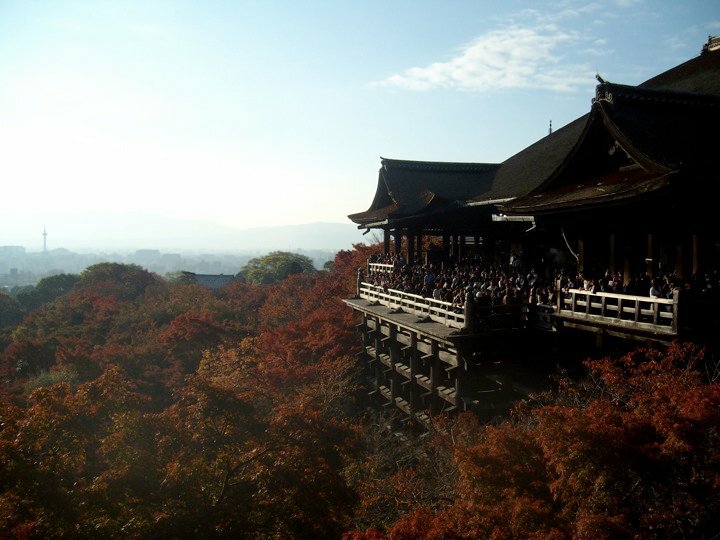 From there, you start your ascent to Kiyomizudera via the Ninenzaka and Sannenzaka steps; turning left at the top of Sannenzaka you’re on the final steep approach to Kiyomizu temple. 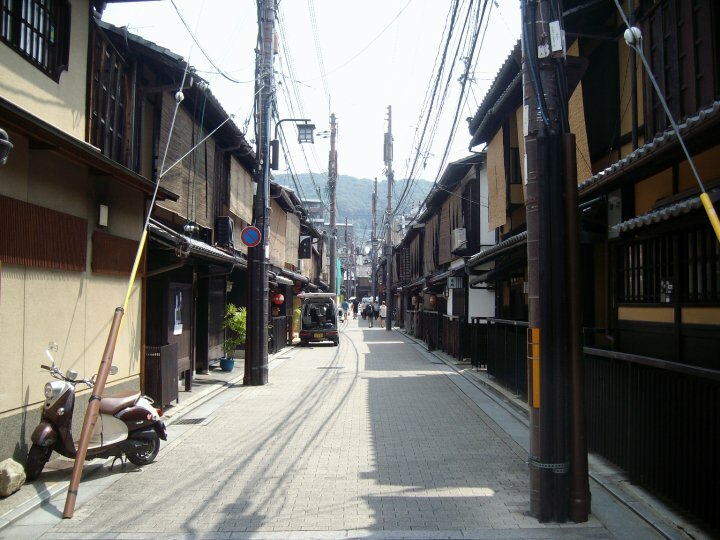 These steps and streets are lined with teahouses, craft stores, souvenir shops, and restaurants, and have a nicely preserved old Kyoto feel (though while also usually being very crowded). On a busy day it does feel like a bit of a tourist trap, but if you catch it when it’s quiet (a drizzly weekday afternoon maybe) it’s a really neat area; also, while a lot of the shops are selling tacky souvenirs, others are Kiyomizu pottery workshops and art galleries with some very, very nice pieces of work on display and on sale. While you’re walking up, grab yourself a matcha (green tea) ice cream cone and make sure to sample the yatsuhashi (traditional Japanese confectionary) you’ll be offered as you pass the shops. 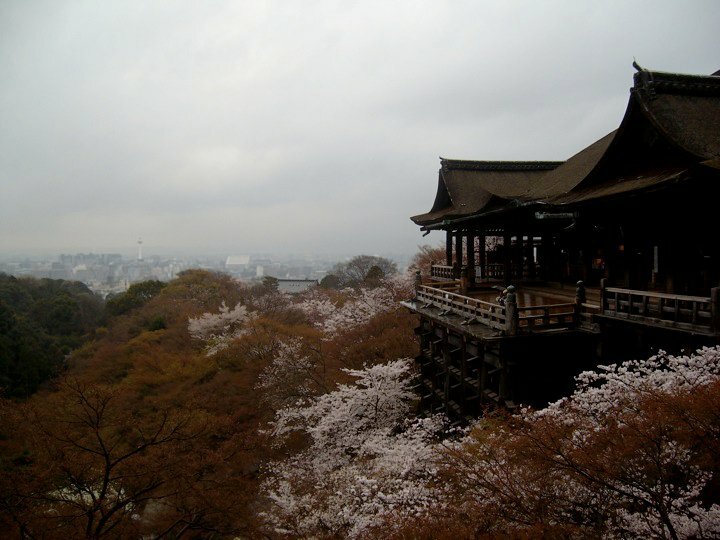 Once at the top you can visit Kiyomizudera, one of Kyoto’s most famous temples and another nice cherry blossom (or autumn colour) spot; it doesn’t actually take all that long to visit the temple grounds, and once you exit I recommend finding your way down through the neighbouring cemetery. 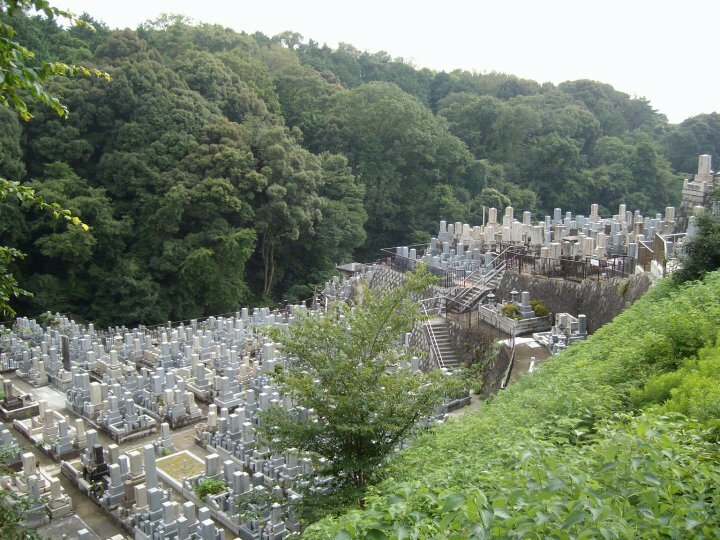 Japanese cemeteries are universally well-tended, and this large cemetery is really quite beautiful and is a nice peaceful alternative to the crowds on the main temple approach. 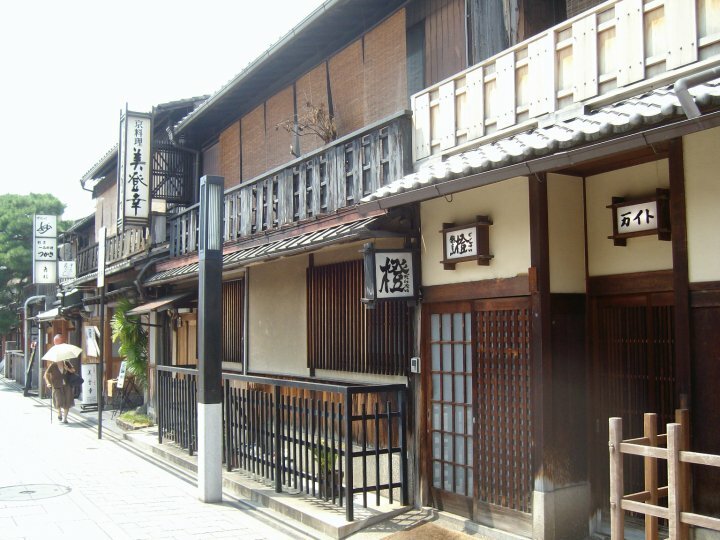 Once you reach the main road (Higashi-oji Dori) at the bottom, you can grab a taxi, wait for a bus to Kyoto station, or walk another ten minutes west along Gojo Street to Kiyomizu-Gojo Station on the Keihan Line. Doing this walk at a reasonably brisk pace and only actually entering Kiyomizu temple would require perhaps two hours, allowing for photo stops; taking it at a more leisurely pace, with time to wander off along interesting side streets, make lots of photo stops (especially likely if you’re there during full bloom), stops for food & drinks, and entering each of the temples along the route, it can easily become a full-day walking tour. A further recommendation once you’re done would be to jump on the Keihan line for ten minutes down to the incredible Fushimi Inari shrine. Any questions? 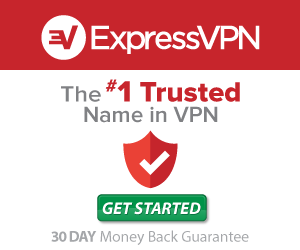 Leave a comment below and I’ll get back to you. We are coming to Japan in early May and have a free time from early afternoon on the 8th and all of the 9th, so I was very pleased to find the forum and your wonderful walking tour. 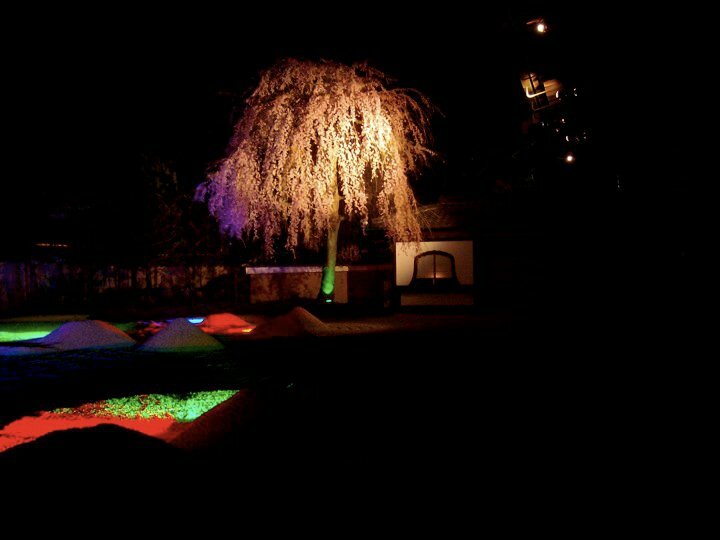 Like the person who initiated your responses I also liked the idea of visiting the Arashiyama district but thought a whole day there would be relaxing. Is it being too ambitious to follow your walking tour in 3 to 4 hours? Hi Rosalie, thanks for stopping by! As long as you don’t dally too long in any one place or sit down to eat somewhere, I think 3 or 4 hours is just about perfect. 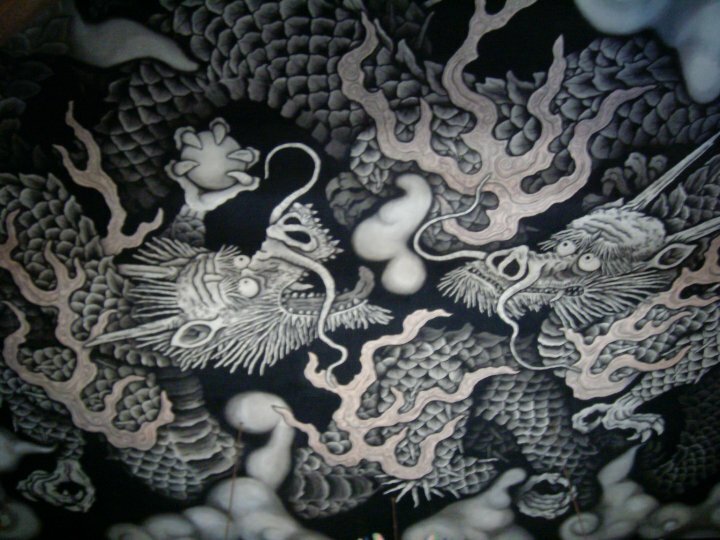 I hope you have a great trip to Kyoto, it’s a wonderful city. Enjoy! 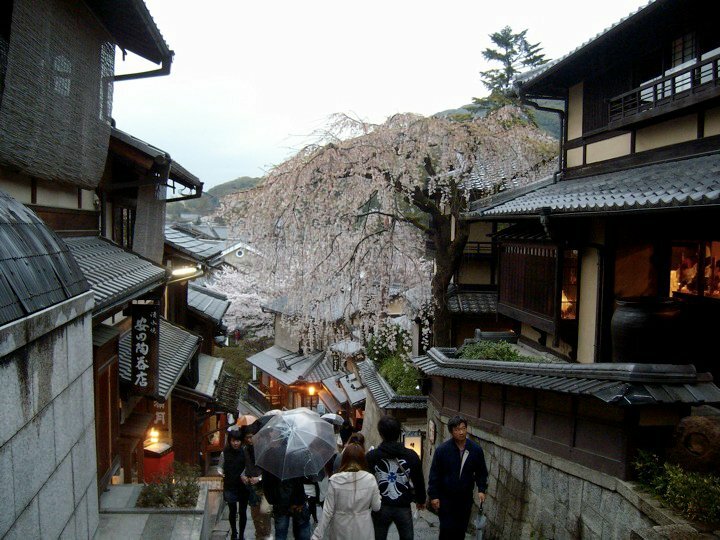 Hello, Im Amor , my family and I are going to Kyoto on May 2-3 and I find your suggestion very helpful. 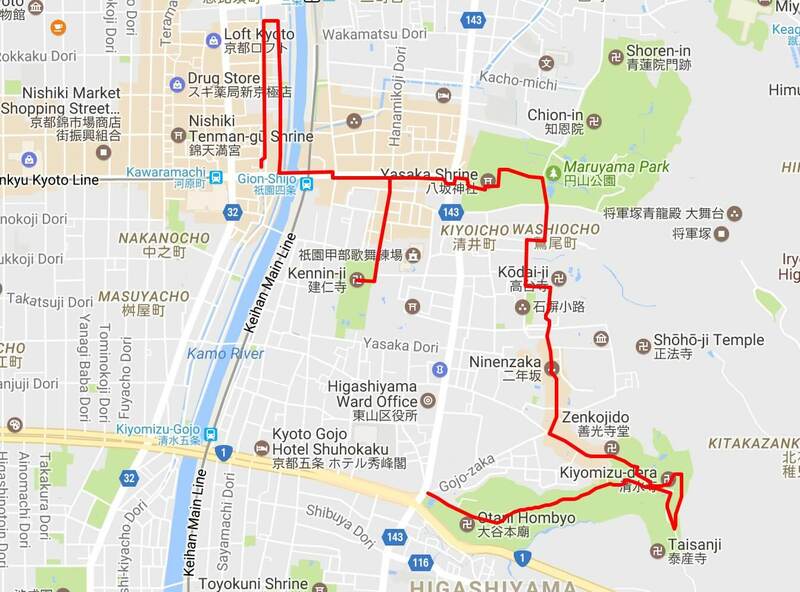 Sir would you recommend renting a bike instead of walking.. First day, we plan to take a tour all around Kyoto and on the 2nd day Half of Kyoto then we will proceed to Nara. 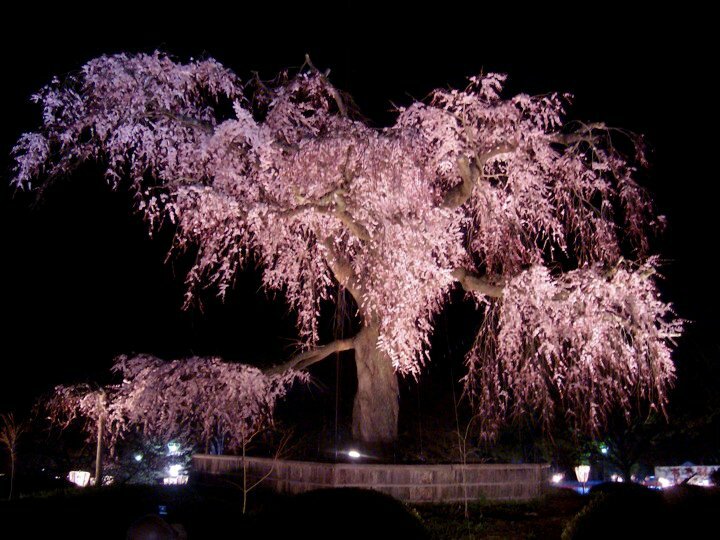 If we start at the western District of Kyoto on the first day, which District of Kyoto will be included on our first day, and which District on the 2nd day. Thank you very much. Thanks for reading, that’s great you’re going to Kyoto next week and I’m glad to hear my post is helpful! 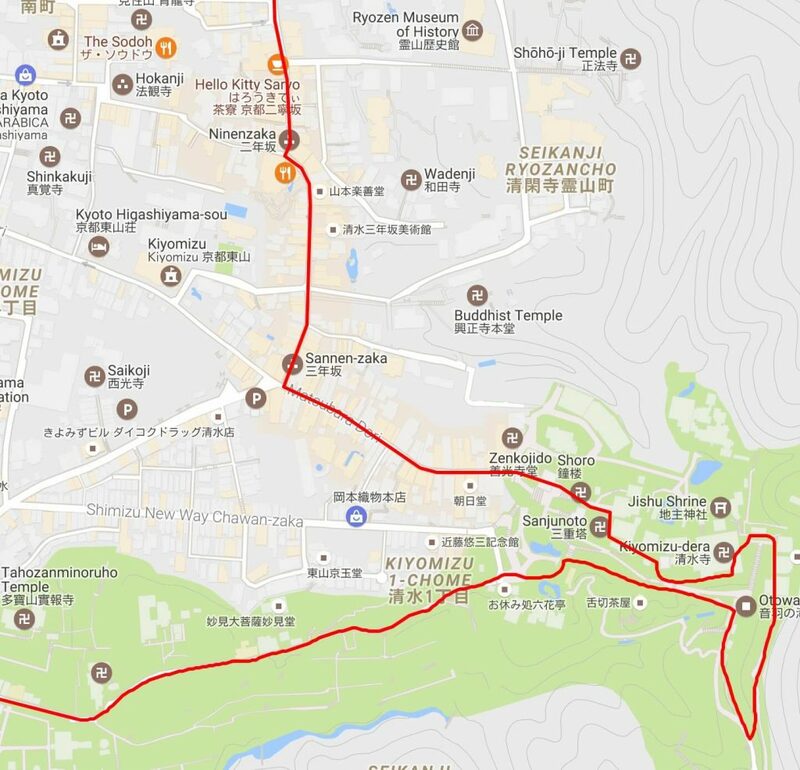 Yes, bikes are a good way to get around Kyoto, though maybe not for the Higashiyama & Gion walking tour I described in this post – the steps and roads up to Kiyomizu temple are very steep. Bikes are definitely a good idea for western Kyoto though. 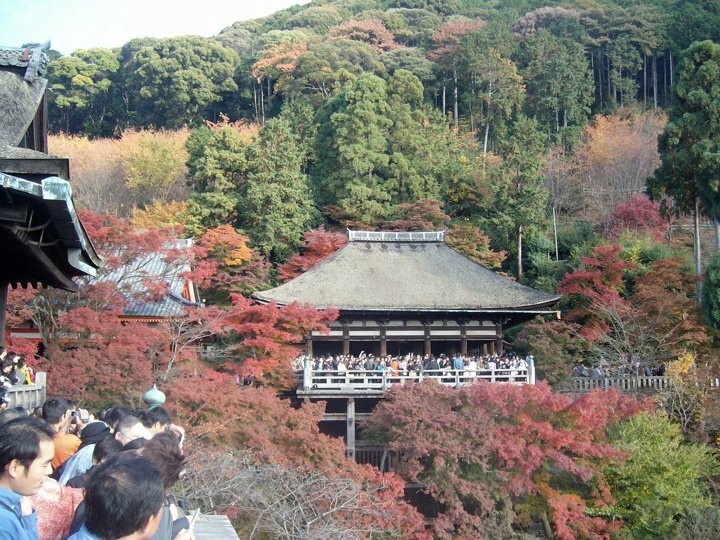 You could start with Arashiyama, and then ride to Kinkakuji (the Golden Temple). 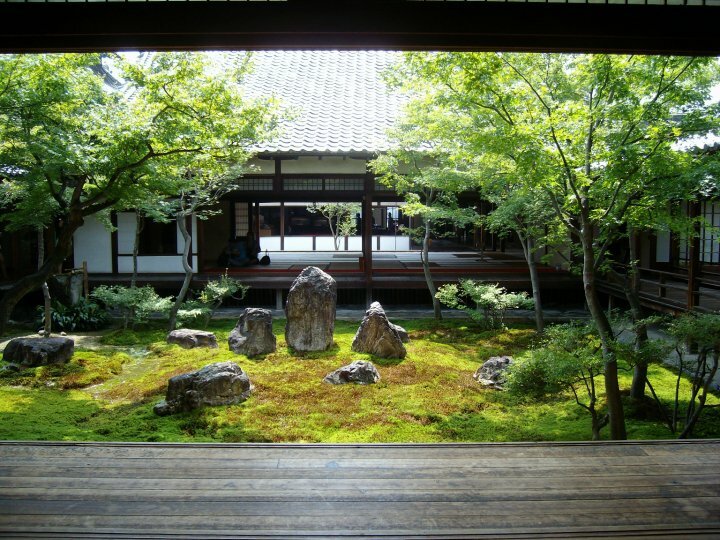 On the way to Kinkakuji you should also visit Ninnaji and Ryoanji, two more very famous temples. I think this would involve about 7 or 8 km of bike riding. You’ll also have to return the bikes, so that might be enough for one day especially if you have kids with you. On the second day you could do the walking tour I described above in the morning, and then head down to Nara in the afternoon; I strongly suggest trying to also visit Fushimi Inari shrine – it’s on the Nara train line. 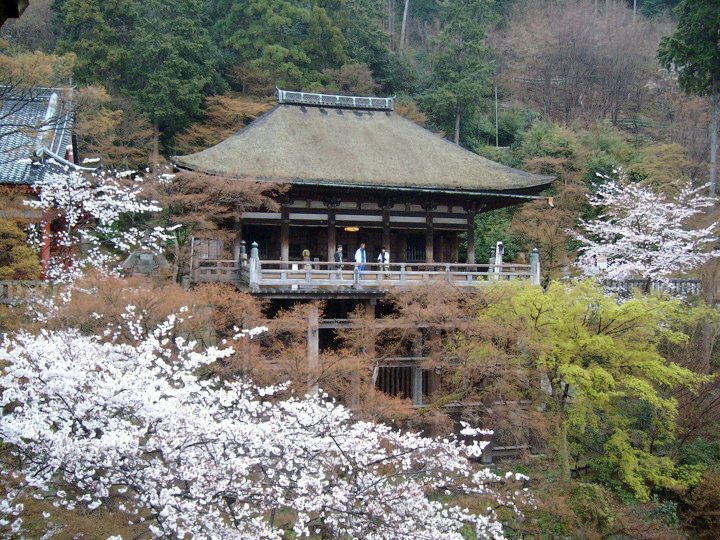 The route would be – after doing the above walk, take the Keihan line from Kiyomizu Gojo station to Tofukuji station (5 minutes), then switch to the JR Nara line to reach Nara. When coming back from Nara, get off the JR Nara line at Fushimi station and visit Fushimi Inari shrine (it’s open at night). Finally, from Fushimi Inari, you can take either JR line or Keihan line, depending where you’re staying in Kyoto. Again, if you have young kids with you this could be too much! But Fushimi Inari really is awesome. 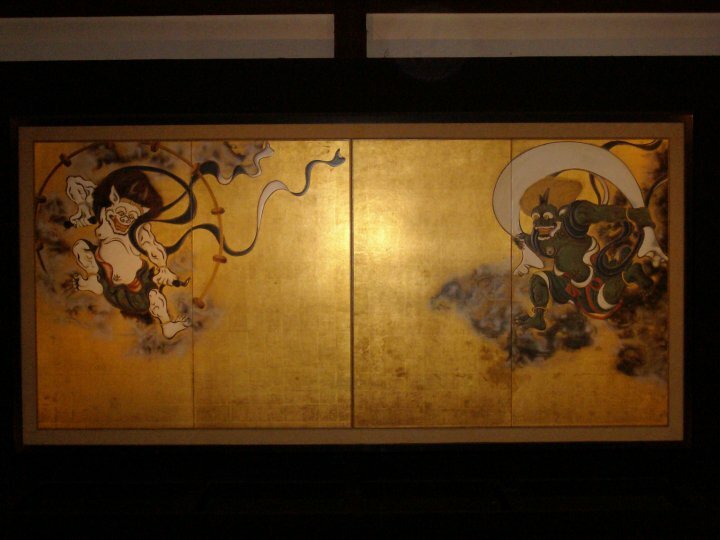 Have a great time in Kyoto, and if you have any more questions, please do ask! 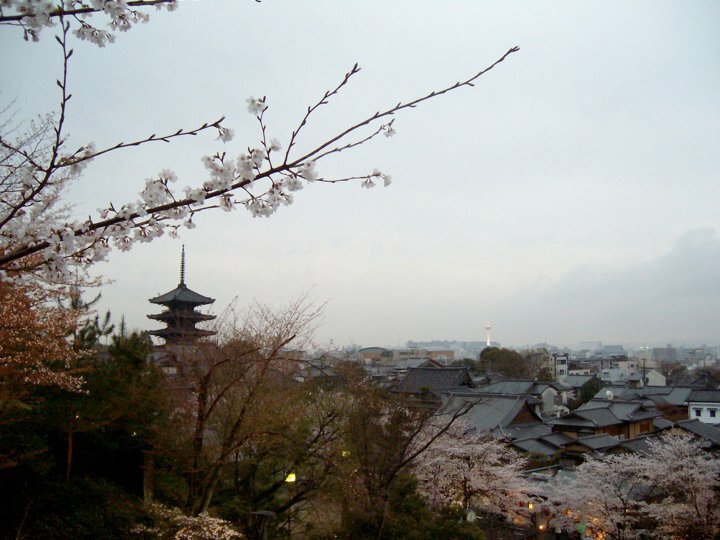 Thank you , your suggestion is really of great help, so excited to visit Kyoto on Monday. God bless you sir, again thank you for time and sharing with us all the information we need. You are most welcome. 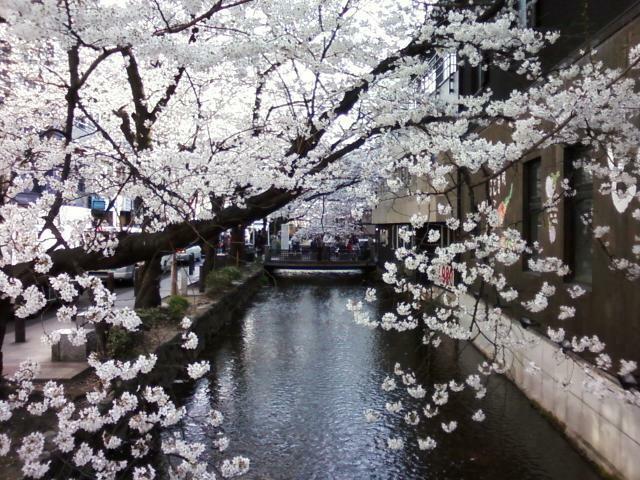 Have a great time in Kyoto!